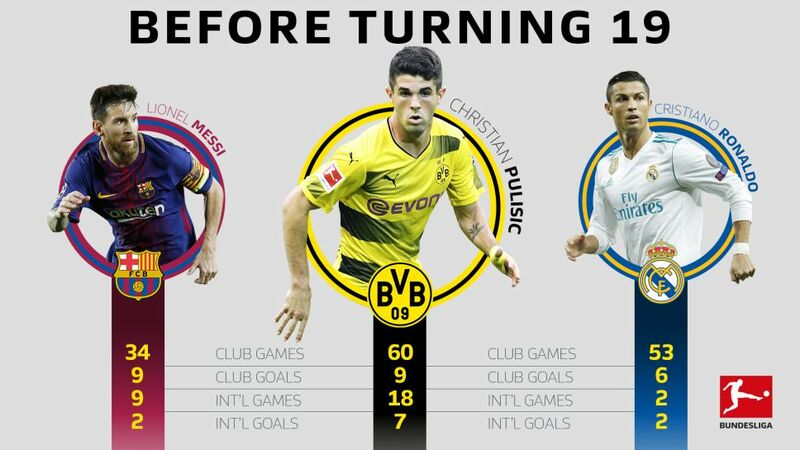 His latest feat being to score Borussia Dortmund's 3,000th Bundesliga goal, we tell you why Christian Pulisic is better now than Cristiano Ronaldo and Lionel Messi were when at the same stage of the BVB star’s career! Read on ....! He just turned 19 on Monday, yet the Hershey native is already lighting up the world game despite his tender years. Registering his team's 3,000th goal in the German top flight in Die Schwarzgelben's 3-0 win away to Hamburg on Wednesday, Pulisic previously took his overall club tally to 60 games against Cologne on Matchday 4. Portuguese mega-star Ronaldo had amassed 53 prior to his 19th birthday while Messi wasn’t even close to Pulisic in terms of senior game time, the Argentine legend racking up 34 matches for Barcelona. Rosario’s most famous son had scored nine goals for the Catalan giants, a figure matched by Pulisic and one that is three more than deadly attacker Ronaldo. However, it's on the international scene that BVB’s trailblazing teen leaves his Barcelona and Real Madrid rivals for dust. The USMNT’s youngest-ever goalscorer has already appeared in FIFA World Cup qualifiers, a Copa America and several friendlies, racking up 18 games for the Stars & Stripes. That’s double the amount of caps Messi managed with Argentina while it was only midway through his 19th year when Ronaldo began to make a mark with Portugal internationally, at UEFA EURO 2004. Watch: Happy Birthday Christian Pulisic! And then there are the international goals. Pulisic has scored doubles against Saint Vincent and the Grenadines and Trinidad and Tobago while adding single strikes versus Bolivia, Honduras and Venezuela. Those seven goals stand in stark contrast to Messi’s two for Argentina when the five-time FIFA Ballon D’Or winner was on the cusp of turning 19. Should he continue along the same, successful path he has embarked upon, Pulisic will be helping himself to the same footballing accolades lavished upon the likes of Messi and Ronaldo in no time.